When learning to drive, one of the biggest things to remember is the stopping and the breaking distances of the car you are driving. To be behind the wheel without knowing or being able to remember the distances can be extremely dangerous, not just to yourself and your passengers, but to others on the road too. At Wimbledon Driving School, we recognise this and feel it is important to point out how to remember the calculations to everyone who learns to drive in order to give them the best chance of mastering their driving test. Firstly we will look at stopping distance. So what exactly is the stopping distance? 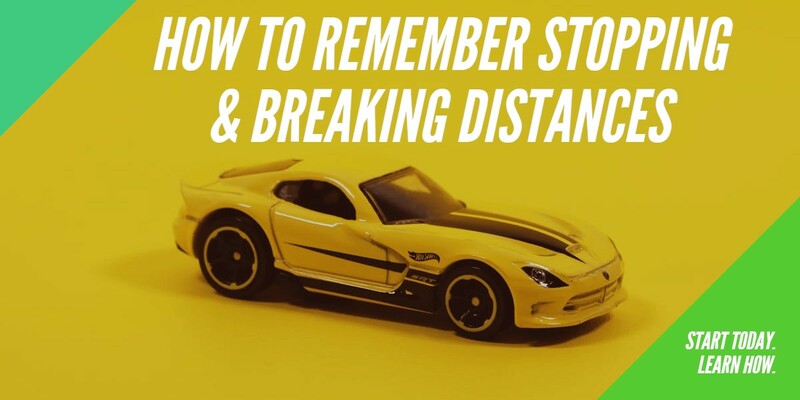 Put simply, it is the distance the vehicle covers in the time it takes to react to a hazard, also known as the thinking distance, added to the distance you travel between hitting the break and actually coming to a stop, known as the breaking distance. This is worked out by taking the speed of the car, adding in a ‘factor’ which is acknowledged to begin at 2 and increase in 0.5 intervals, and multiplying the two together. If the car is travelling at 20mph with a factor of 2 the stopping distance would be 40 feet (20×2). If the car is travelling at 30mph the factor would be 2.5 meaning the stopping distance would be 75 feet (30×2.5). At 40mph the factor would be 3, so the stopping distance would be 120 feet. 50mph has a factor of 3.5 meaning a stopping distance of 175 feet. With 60mph, the factor is 4 so the stopping distance is 240 feet. And at 70mph the factor would be 4.5 so the stopping distance would be 315 feet. Now let us look at the breaking distance. Once again, what exactly is the breaking distance? The simple equation to work out the breaking distance is to take the stopping distance and remove the thinking distance. The thinking distance is generally accepted as being the same in feet as in mph, so if the car is travelling at 30mph the thinking distance would be 30 feet, if it is going at 60mph it would be 60 feet and so on. For all of the above figures, we must stress they are worked out on dry road conditions. If you want to convert from feet into metres a general comparison would work out at 30 feet to equal 10 metres. It should also be pointed out that in wet conditions the stopping distances are doubled, and if you are driving in snowy or icy conditions, then the stopping distances could be more than 10 times it would be when you are driving in what would be considered normal conditions. When learning to drive with Wimbledon Driving School, ensure you have those calculations memorised to give you the best chance of passing your driving test.